In Part One of this series, Quwa had argued that the Pakistan Navy’s (PN) efforts to enlarge the size of its surface combatant fleet through the purchase of four Type 054 multi-mission frigates from China will not be enough to build credible sea-control capabilities. Rather, the PN’s focus is to continue reinforcing its burgeoning anti-access and area-denial (A2/AD) capabilities which, at least in the case of the Type 054A, would offer a measure of anti-air warfare (AAW) coverage and long-range surface targeting capability to small attack boats, namely the Azmat-class fast attack craft (FAC). A key facet to this A2/AD strategy is the deployment of the Harba dual-anti-ship cruising missile (ASCM) and land-attack cruise missile (LACM). This is discussed in greater detail in a previous Quwa Premium article. In parallel, the PN is also working to recapitalize its conventional submarine fleet. Today, the PN operates three Agosta 90B air-independent propulsion (AIP)-powered submarines (SSP) and two Agosta 70 diesel-electric submarines (SSK). The three Agosta 90B SSPs are slated to undergo a mid-life-update spearheaded by Savunma Teknolojileri Mühendislik A.Ş. (STM) under a $350 million US deal signed in 2016. The PN has thus far awarded two contracts (out of the three ships), with the first due in 2019-2020. The main intent of the Agosta 90B upgrade is to equip the submarines with new electronic equipment, including sensors. However, the mainstay of the PN’s fleet development – be it in terms of submarines or from the angle of the naval fleet as a whole – are the forthcoming Hangor (II)-class SSPs from China. The eight ships are due for delivery from 2022 to 2028. 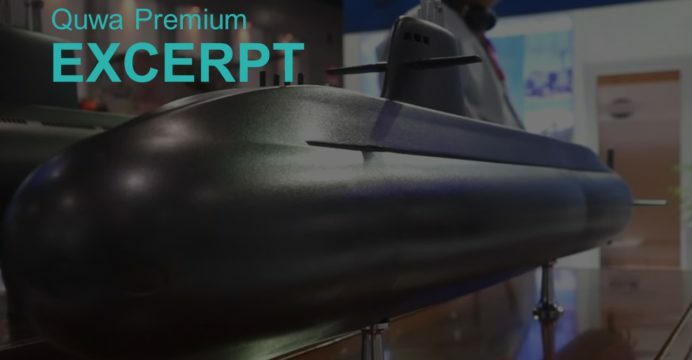 The exact SSP model has not been disclosed, but existing mock-ups of the design show a variant of the China Shipbuilding Industry Corporation (CSIC) S26 SSP. The S26 is an export variant of the People’s Liberation Army Navy’s (PLAN) Type 039A/041 Yuan-class SSP. Thailand agreed to purchase the S26T SSP for an average unit-price of $347 million US. Thus far, a major angle in which the PN’s Hangor (II) SSP purchase has been discussed is from the view of enhancing Pakistan’s nuclear-based deterrence capabilities. Specifically, the Hangor (II) SSP – when paired with the Babur submarine-launched cruise missile (SLCM) – will let Pakistan deploy nuclear warheads from sub-surface conditions. However, limited attention has been paid to China’s catalogue (that it is offering for export) of sub-surface ASCMs, notably the CM-708UNA and CM-708UNB, which possess ranges of 128 km and 290 km, respectively. Both ASCMs were unveiled as export-ready designs in 2016. In other words, the PN has the theoretical groundwork – be it through the CM-708UNB or even an ASCM-variant of the Babur SLCM – to construct a large anti-ship warfare (AShW) element from the sub-surface domain (augmenting the growing surface, airborne and land-based capabilities). However, coupled with the potential ability to deploy long-range ASCMs, the PN is also (or at least was in 2016) pushing for a new miniature SSK design to supplant its aging 119-ton Cosmos MG110 (SX756/W) mini-SSKs. Succeeding in this respect could spur a significant expansion of the PN’s sub-surface capabilities. Granted, it is unclear if the PN intends to procure ships equipped with AShW and anti-submarine warfare (ASW) capabilities. But the mini-SSK market is offering such designs, not just in China, but in Italy, Russia and the UK as well. The strength of numbers along with an increasingly capable pool of suppliers that are willing to offer long-range ASCMs, modern sub-surface electronics such as electronic intelligence (ELINT) equipment, pulse-Doppler radars and combat management suites (CMS) provides the PN with options to build credible AShW and ASW A2/AD capabilities through mini-SSKs. “Defense Industry Focuses on Quality and Quantity to Step-up Turkey’s Exports.” Defence Turkey. 30 September 2016. URL: https://web.archive.org/web/20161121203521/http://www.defenceturkey.com/index2.php?p=article&i=2424#.WkSZTN-nGUk (Last Accessed: 28 December 2017). Wassana Nanuam. “Navy secure funds to buy Chinese sub.” Bangkok Post. 25 January 2017. URL: https://www.bangkokpost.com/news/security/1186061/navy-secures-funds-to-buy-chinese-sub (Last Accessed: 17 June 2018). Richard D Fisher Jr. “DSA 2016: China details new sub-launched ASCM and old LCU.” IHS Jane’s Defence Weekly. 21 April 2016. URL: https://web.archive.org/web/20160422115743/http://www.janes.com/article/59687/dsa-2016-china-details-new-sub-launched-ascm-and-old-lcu (Last Accessed: 17 June 2018).